Jet enjoys the company of Marcy, the canine member of our household. At 10, Marcy, a Havanese, is the oldest of the three dogs in Jet’s immediate family. All of the dogs accept Jet as a member of their greater clan and all exercise great forbearance with her attempts to love them more strenuously than they would like. Marcy seems to recognize that Jet’s cry signals a need for attention. She often leads me to the bedroom when Jet wakes from her nap. I like to imagine that the dogs recognize that she is very young, but perhaps they just appreciate her for her tendency to drop bits of food. 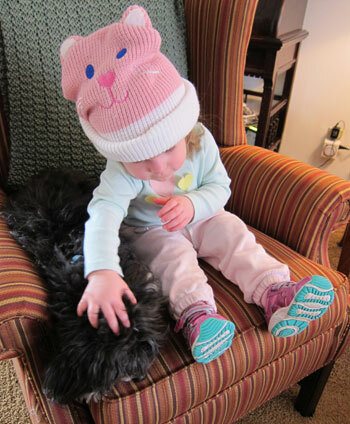 From the moment her tiny hand was able to grip fur, Jet has been guided to treat animals with respect and gentleness. 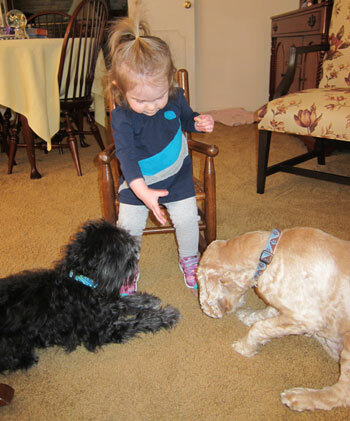 As she grows, her behavior sometimes indicates that she sees little difference between the canine “children” and herself and the dogs sometimes seem to treat her as a member of the pack. Jet expects the dogs to be included in any human outings and gatherings and to participate in her play. She talks to them with a high expectation that they will understand what she has said. When she moves to another room, she expects the dogs to follow. The dogs, of course, oblige. They know all about their duty to the pack (and she might have spilled something on her shirt). In return, Jet watches their food and water and calls attention to the need for replenishment. Two weeks ago, I realized that Marcy had begun to pace herself to remain exactly next to Jet on our daily walk. I wondered if this meant that she had categorized Jet as a pack member of equal standing. During this time, Jet’s directions to Marcy fell on deaf ears. Although her commands were a credible imitation of the adult versions they were completely ignored. I didn’t realize that Jet was well aware of the situation until she climbed onto the couch for a story. “Come, Marcy,” she said, furiously patting the space next to her on the couch. “Come, come, come Marcy, come Marcy.” She did not want me to start reading until Marcy had joined us. “I don’t think Marcy wants to come,” I said. Immediately, Jet grabbed my hand and used it to pat the couch instead of her own — and Marcy leapt into the space. I congratulated myself on the cleverness of my granddaughter to have devised such a solution to her desires. Then the balance of power began to change. Perhaps Marcy’s favorite game was responsible. Marcy loves to play “Hide and Seek the Biscuit.” She waits in the kitchen while biscuits are hidden in the living room. When released, she hunts them. Jet loves this game too. “Marcy treat,” she begs. I give her three mini biscuits. “Wait, wait, wait,” she admonishes Marcy. She takes the biscuits in the other room while I hold Marcy to the command. Jet carefully places the biscuits in “hiding spots.” “Okay, Marcy!” she says, and I release the dog too. “Find it!” Jet chortles, and the hunt begins. 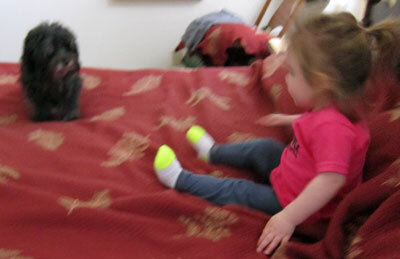 Within seconds, Jet’s enthusiasm renders her unable to resist showing Marcy exactly where to find each treat. On Wednesday, I was astonished to observe that Marcy had awarded Jet the right of command. “Come!” ordered Jet, and Marcy immediately joined her in the play tent I had set up in the living room. This was surprising obedience indeed for a dog that has taken to feigning deafness when the command fails to suit. Then we went to the backyard to enjoy some spring sun. Jet asked me to lift her up on the picnic bench. She patted the spot next to her. “Marcy, come, sit!” she urged. Marcy obliged in one fluid motion. I had barely closed my gaping mouth, when Jet got down to walk around the yard. When she returned to the bench, the dog was busy checking out some delectable rabbit scents. “Marcy!” she called, and once again the pint-sized leader prevailed. Marcy jumped to the bench and pushed her nose close to Jet’s. They looked at each other. Jet leaned slightly toward Marcy and they touched heads. I held my breath as Jet placed her arm across Marcy’s back, and we all sat in the sun.